I’m a big fan of rolled oats. They’re really good for you – that is if you get the right kind. The bran reduces cholesterol while the kernel contains such a high concentration of protein they’re right up there with eggs, soy and even meat. Not all packaged oats are created equally, some have been processed so much you might as well eat styrofoam. What is it about the processing that makes some oats better than others? 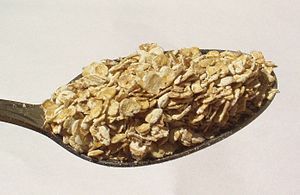 It’s the presence or absence of oat bran which contains the linoleic acid and gamma linoleic acid, (LA and GLA) which lowers cholesterol, so if you eat oatmeal that has had all the bran removed you’re not getting the goodness oats are touted for. Good for your health in so many ways, whole grain oats will relieve gout, while the straight, unrefined grain – or grass – can help menstrual problems, osteoporosis and urinary tract infections. And I’m sure you’ve heard the one about slathering your face with oatmeal and honey! But we need that goodness inside, as well as outside our bodies, so we do need to eat them. You don’t only have to eat porridge to get your oats, you can also cook and bake with them. 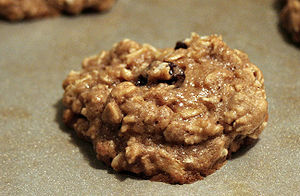 Oats are delicious made into Oatmeal Cookies (or biscuits as the Brits call them!) 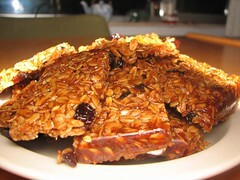 Flap Jacks, which are popular in the U.K. were a treat my Dad used to make for us kids. Rolled Oats blended with milk, butter, sugar and Golden Syrup , pressed into a pan and cooked in the oven just long enough to make a delightful crispy yet chewy and sweet yet healthy snack. Dad also used oats to thicken soups and stews, stirring a little into the cooking liquid. Careful how much you use! 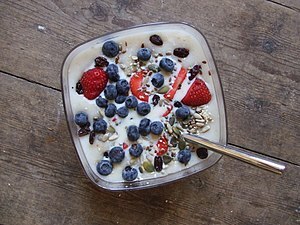 He even used left-over cold porridge from the fridge. The first time I saw him do that I screamed: “NO DAD! DON”T!” He ignored my pleas and carried on. It worked beautifully. It was one of the best turkey soups made from the Christmas carcass we’d ever had. 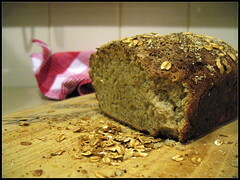 I learned to bake one of my favorite recipes Oatmeal-Molasses Bread when I was a child. 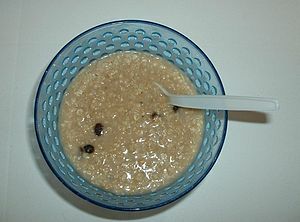 Oatmeal and Raisins: Add about 1/3 cup of raw, rolled oats with a pinch of salt and a handful of raisins to about a cup of boiling water and simmer uncovered, stirring occasionally, until it starts to thicken. Add a little milk, return to the boil, and simmer until it’s the consistency you like. I prefer mine kind of like runny glue. Cook the oats as described above, adding 1 fresh apple, sliced, with about a teaspoon of sliced, fresh ginger, and 1/4 tsp cinnamon and 1 or 2 dried cloves. Increase or decrease these spices to suit your personal tastes! Whichever way they’re cooked, you can always increase both flavor and food value by serving drizzled with honey, yoghurt and topped with chopped nuts and seeds. Shelled hemp, and golden linseed bring valued omega while a couple of chopped Brazil nuts bring selenium. All 3 also add protein. Years ago I used to enjoy poaching an egg on the top of the cooking oatmeal. It needs to be added while there’s still a little water before the oats are completely thickened. I’d cover the saucepan with the bowl I was going to eat from. Yes the bowl was hot! So much the better for a cold, Canadian morning. I love the cracked oats, too, that you find as “Scottish” oatmeal. A lot of texture when used in your porridge! I’ve never heard of cracked oats either. They sound fun! I had no idea you could put oatmeal in soups to thicken them. Alison, you have such good ideas! I’m going to make those oatmeal cookies too! Hey Jen, Let me know how the cookies turn out. I couldn’t find my recipe so I linked to that one, thought it looked good. Re oats in sauces: I was at a friend’s house the other evening and she was making spaghetti sauce and wanted to thicken it so I put some oats in. She didn’t want me to do it but, like my dad, I just carried on. She was amazed by the results! After we had eaten she told her daughter what I had done and she said:”But where are they Mom?” Mom said:”In the cupboard over the stove.” Daughter: “No I mean the sauce. I didn’t see any.” Mom is delighted to have learned a new trick for thickening soups and sauces. I’ll bet the southern food will be great!